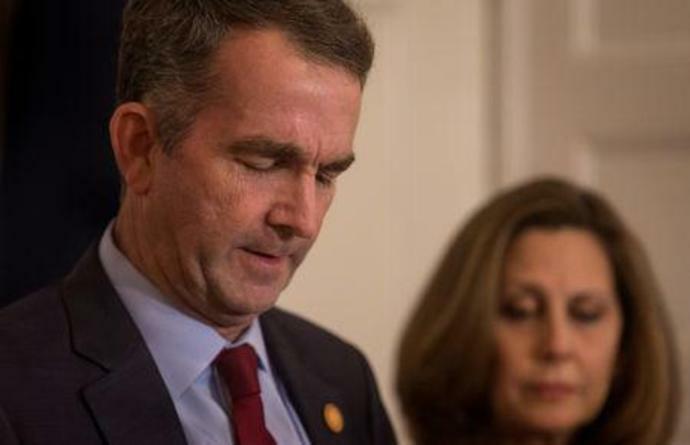 (Reuters) - Embattled Virginia Governor Ralph Northam on Tuesday resisted calls to step down over a racist photo on his 1984 medical school yearbook page, with the state's Democratic Latino organization joining the chorus seeking his resignation. The first-term Democrat has been under fire since a conservative media website released the photo on Friday, which showed one person in blackface standing beside a masked person in the white robes of the white supremacist group the Ku Klux Klan. Northam, who has avoided the public since Saturday, faced calls to step down from many top Democrats in Virginia - seen as a key swing state for the 2020 presidential election - as well as from at least five Democratic presidential candidates. Monique Alcala, the president of the Virginia Democratic Latino Caucus, became the latest to urge Northam to quit. In a telephone interview she said she believed his record showed he was not racist but that Northam should reign because he had lost the moral authority to lead. "On matters of equity and justice you really have to have trust with the community and this has really violated that trust," she said. Northam, 59, who is white, initially apologized on Friday and said he was one of the two people in the photo. He changed his story a day later, saying he did not appear in the picture but had dressed in blackface at another point that year to portray pop star Michael Jackson in a dance competition. Northam has been huddling with advisers and cabinet officers while his political heir apparent, Lieutenant Governor Justin Fairfax, 39, confronted a potential scandal of his own. Should Northam resign, Fairfax is in line to become the second African-American governor in the history of Virginia, where his great-great-great grandfather was a slave. The first was Douglas Wilder, a Democrat elected in 1989.